Says Me Says Mom: Giveaway: Win a Bold Face Custom Backpack in the Wrapping Up Summer Giveaway Hop! 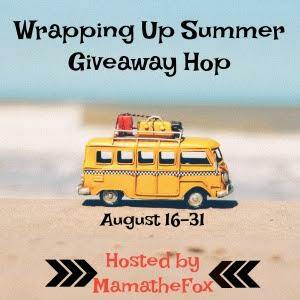 Giveaway: Win a Bold Face Custom Backpack in the Wrapping Up Summer Giveaway Hop! Now, that the summer season is wrapping up and we are heading into fall, we started to gather the things we will need for fall like school supplies. One supply that every child need is a backpack. Most children are excited to pick out a backpack at the beginning of the year, but there is a good chance by the end of the year they are sick of it. What if you could change the picture on your backpack without having to get a new backpack? Now, you can. Bold Face offers backpacks with removable front panels that can be swapped for one another. You can also order custom designed panels. Each backpack comes with one front panel but you can order as many as you want for about $20.00 each. For more about Bold Face backpacks see our previous post Tips for Tuesday: Bold Face Backpacks or visit www.boldfacegear.com. Enter to win a custom Bold Face Backpack, below. Once you have entered our giveaway, hop around to the other blogs listed below to see what other great prizes you can enter to win. Thanks for visiting Says Me Says Mom and for your comment. It would be for my son and I think he would draw something to put on the backpack or a picture of our dog and cat. My daughter would love to have one with a picture of our cats. Thanks for visiting Says Me Says Mom and for your comment. My daughter loves animals too. Thanks for visiting Says Me Says Mom and for your comment. I would like a backpack with a pic of my late Boston Terrier, Rozy. That sounds like a great way to memorialize your late dog. Thanks for visiting Says Me Says Mom and for your comment. I would let my daughter get one of her own designs on the backpack! Sounds great! Thanks for visiting Says Me Says Mom and for your comment. What a nice idea! Thanks for visiting Says Me Says Mom and for your comment. I'd like an animal theme! My daughter would like that too. Thanks for visiting Says Me Says Mom and for your comment. I would probably put a heart! That sounds nice. Thanks for visiting Says Me Says Mom and for your comment. I'm really not sure. If I get that far, I guess I would ask my daughter what she would like. I'd like to read about holiday crafts kids could make because in their church group they make gifts for senior citizens for Christmas. Thanks for the suggestion and for visiting Says Me Says Mom. My grandson would like one of these with a deer on it!! Sounds great. Thanks for visiting Says Me Says Mom and for your comments. I would like a backpack with Disney Characters. Disney is always great. Thanks for visiting Says Me Says Mom and for your comment. That's nice. I bet she'd love that. Thanks for visiting Says Me Says Mom and for your comment. I like the Moon Tide Backpack design. Yes, that is a nice one. Thanks for visiting Says Me Says Mom and for your comment. I would like to see flower pot crafts. Thanks for the suggestion and for visiting our blog. Def Lepard would be great. Thanks for visiting Says Me Says Mom and your comment.